How do you come up with inspiration for new models? Is it more people asking you to make a certain thing and you figuring out how to do it or do you set your self challenges and then try to create them? The Road to Balloons is pathed with pinch twists and turns. What road led me to balloons? I don't have any interesting story to tell here. Mike and I liked to be involved with the school our children attended and helped in any way we could. Mike was charirman of the School Parents Association so when it came to the Shool Fete day I felt duty bound to come up with a fund raising idea. I had seen face painting done locally and it was all of a very poor standard so I thought I would buy a pallet of face paints and have a go. I look back at the faces I did then and think "Oh goodness they are so bad!" But the parents thought they were smashing and one asked me if I would come to her childs birthday party and do the children there. That let to another request and I found it fun to do. I gave all the money to a charity and just kept enough to buy more paints when they ran out. One day I was at a party where there was an entertainer and he said he had seen me before and was impressed but he thought I should buy some balloons and incorporate them. 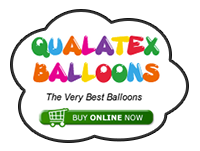 He took me to a supplier and I purchased one bag of 260 balloons and two instruction books. Before I had finished that first bag of balloons I had done all the mnodels in the books and had designed a couple of my own. It was love at first twist. I discovered a bag of 100 balloons came with a potential for 100 smiles. Its the reaction that grabbed me. I am still as bowled over by the pleasure a bag of balloons can bring as I ever was after 13 years. What was the worst. Well life is a blurr of happenings. There are a few incidents that do stand out but happily nothing too disasterous. There was one incident that could have ended iin disaster of the worst kind and I thank the stars and a little girl called Elizabeth that it didnt happen. I hadn't been working for very long and I had a lot to learn. I was still at the stage where I was letting the parents pull my strings instead of taking contol and letting them know I am in charge. I was asked to entertain some children at an outdoor party. The people told me to bring my daughter with me if she liked to come. I would not bring my daughter to a booking now but it was when I was very very cheap and doing it for charity so I brought her along. When I arrived I discovered they had an outdoor swimming pool and the children were all in the water. I asked who was supervising and the parents said the kids were ok in the water and left me to paint and do balloons by the pool. After a while the chldren went for food and i was finisheing off the last few. Suddenly the birthday girl ran past me and dived into the pool to the bottom. She came up with my daughter. She was 6 at the time but could not yet swim. I had seen her go off with the children to eat but unknown to me she had come back and decided to have a paddle but lost her footing. Elizabeth saw her go in and saved her. I was totally unaware of the awful thing that was happening. I felt that I should have known something was wrong being her mum and I was gutted and felt like a very bad mum. I would never agaiin bring my chilkdren into a situation where I was not able to supervise them myself. I will never ever work with children near water unless there is an adult supervising 100% of the time. Another bad moment was when I was doing my puppet show and some hair from my puppet went down my windpipe and I was retching and gagging and my eyes were watering..... welll you had to be there. It was bad. Once I turned up to do a party and there were more than three times the number of children I had been told. I was supposed to be doing half and hour of balloons and half an hour of games. I had not done even half the children by the end of the first half hour and felt mean not doing them all so after the games I said I would stay to do the rest of the children a balloon but that they would have to be quick models because I was not booked and it was free time I was giving. Most people were alright but then one of the parents - yes the parents - threw the model down indisgust and said "I want something better than that, I am related to the person who paid you. I was over three quaters of an hour over my finish time and I was very annoyed with him. I said if he didnt want the model he could go without I wouldnt force him to take it. He then proceeded to abuse with words that I could never type on here. Itold the rest of the people that I was going and if they didnt like it they knew who to blame. The man followed me out to the car park and threatened me with physical violence. It was really shocking. One of the guests came to my rescue and assured me everyoje was very embarassed and they were all very grateful and ppreciated the extra time I had given but to be frank the I went away with the realisation that if you give extra you don't necessarily get any respect for it. It seems the longer you stay and the more effort you give above the time you are booked, the more likely you are to come up against abuse. So now I do the time and go. Well nearly always.. Sometimes its hard to say no. I dont have one - sorry. I just love balloon art and ballooon work and entertaining. I have good memories and bad but nothing I could say is above anything else. The work is mostly about a high. Hi Bickers, I hope everything is ok. Noticed you haven't been as active recently. What inspires me to design. Hmmmm. All sorts of things. People who ask me for something I havent done before. Not a rare thing because when I work I tell people they can challenge me. I will try anything they suggest as long as its possible. I also tell them they cant have the model I just made because I don't like repeating. If I am not totally happy with the model I come up with I go home and work on it. If I am still unhappy with it I go to bed and design it in my sleep. I literally go throught the whole design twist by twist iin my sleep. Its not unusual for me to wake up at 3am and jump out of bed to make the model I just designed while it is fresh in my head. I look at things in everyday life and see the potential. Shop window dispays, stories, cartoons and films and daily situations. Just life generally. Also sometimes I try to make something and end up seeing the potential for somethiing totally different. Brian Asman once told me he can sit for ages just turning something around and around looking at it from all angles and seeing the possibilities. Its surprising how many things you can come up with. There are a few incidents that do stand out but happily nothing too disasterous. I thought your journey to TMJ might have been on your list but after reading about your daughter I can see why it's not. What is my favourite age to entertain. It depends on the job. But if you are talking about birthday parties then without any hesitation I have to say 4. Four year old children are old enough to grasp a lot of humour, They can play the games. They are old enough to have a great time but still young enough to believe in magic. They go home telling mum that they had a real live monkey at the party. Five year olds are a lot more street wise. If I am doing a wedding, my favourite venue to work then I enjoy entertaining the adults in the process of entertaining the children. I go round the tables making balloons for the children before taking them off to have fun during the speeches. The adults enjoy watching the balloon art even more than the children. I dont enjpoy adult only gigs because they usually get drunk and dirty. I have a set plan for birthday parties but keep it flexible within the plan. For example I start with balloons and face painting as it is a nice way to break the ice with the children, Then I do dance and games. Thenthey have food and I domore painting and baloons at foodtime and finish with my magic show. So in that sence its the same for each party unless circumstances dictate otherwise. I like to do the games before the food and the magic after because the children are then sittiing and allowiing the food to go down. The games I play vary with the ages and the magic show varies to cater to the ability to understand humour. I advertise the worst magic show in the Midlands. I am not good at magic so i decided to do a good job of doing it badly. One of my tricks involves getting dad wet. If I do that for the under fives they get upset because they love Daddy and don't understand it is funny. Five and over --- well the more you do to poor dad the more they love it. I am always prepared to change direction too. If I think somethiing is not hitting the spot I do something else. If I walk into the hall and I know the name of all the children I do a play instead of a magic show getting the children involved in it. Here are a few of my present favourite models but I also love to makeMr Balloonatic's fairy on a toadstool. I have about 8 different dog designs using a variety of techniques and distortions. The one here is one of the more straight forward ones but I enjoy maing all of them. dont know how to add more then one just yet it seems so here are the other two I meant to submit. I like doing rideables too. we met at the TMJ - you were a bit stressed after your journey! You mentioned you like making ridables. Do you have any good sources for how to make them? Not really Danny. I just started to do rideables when I was asked for things that took a little too long and wantede a shortcut. For example the giraffe here. I wanted to fiinish the model and get on with the magic show so instead of doing the body for it I put it round the girl and gave it reighs. The model becomes a plaything and is much more fun for the child. The oly problem then is getting them to sit down for the magic show! I have oonly just gotten into doing rideables. Basically you can make most thiings into a rideable. Here are a couple of other rideables. 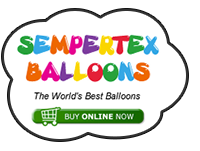 You can see how simple it is to make most balloons wearable. This is the model being used.